May is the hottest month of the year in Mumbai, with highs typically topping 90 F. It’s likely the last time in the year when temperatures in India will top what Austin, Texas can anticipate. 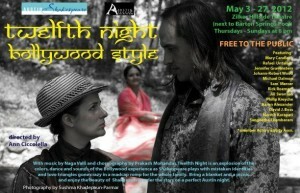 So what better time for a little Bollywood in the park? Austin Shakespeare will put a Bollywood twist on the bard’s Twelfth Night Thursdays to Sundays at 8 p.m. from May 3 to 27. These free shows (donation strongly encouraged!) will take place at Zilker Hillside Theatre, next to Barton Springs Pool. Get there early to claim your spot on the grass. In case you somehow managed to miss reading Twelfth Night in a middle school English class, here’s the gist: This guy named Orsino loves a lady named Olivia. But she’s mourning her dead brother and isn’t in the mood for his advances. Then Viola is shipwrecked and assumes her twin brother Sebastian has been drowned. (Wait, it’s a comedy. Really!) Viola needs some money, so she disguises herself as a man, takes the name Cesario, and goes to work for Orsino. Viola falls in love with Orsino. And Olivia falls in love with Cesario. Throw in a drunken uncle Toby and a foolish fop named Malvolio, and you’ve got yourself a play. Add some Bollywood on top of all that? Sounds like fun! Although I’m pretty certain it’s not what Shakespeare had in mind when he wrote the play, I think the old boy would approve. Bollywood’s bright costumes will lend themselves well to characters like Malvolio. And the Bollywood style of coming straight out and saying (okay, singing) exactly what you mean suits Shakespeare’s soliloquies. Austin choreographer Prakash Mohandas will provide all the dance moves and singer/songwriter Naga Valli will give the actors the background beat. Mary Candler and Rafael Untalan, both graduates of the Shakespeare Theatre Company’s Academy for Classical Acting have the lead roles of Viola and Orsino. Bring a blanket or a low chair and a picnic for nibbling on. Better yet, visit the Indian food cart that will be on site with authentic Indian food and beverages available for purchase. For more information, visit the Austin Shakespeare site.